It is easy to see why a driveway can quickly become dirty. Your car parks on your driveway day in and day out, because of this, your driveway is going to be damaged. A car can leave tire tracks, oil stains and other harmful chemicals on your driveway. These stains can be unsightly and difficult to remove. 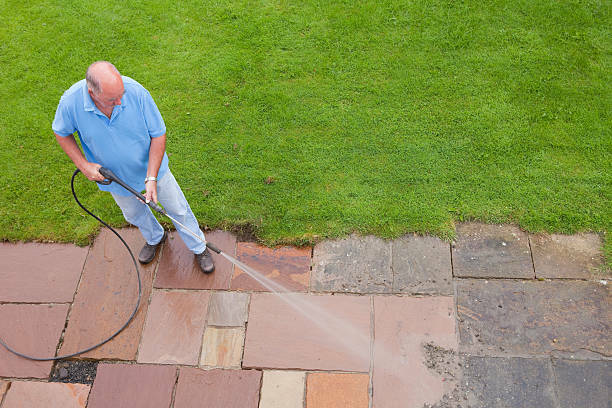 Southern Clean Pressure Washing is a professional power washing company that also provides driveway cleaning services to all of our Driveway Cleaning customers in Kansas City Our professionals have the skills and knowledge to remove the hardest stains from your driveway. When you notice your driveway becoming soiled and dirty, you have a few different options. You can try to clean the driveway yourself through a long and stressful process. Taking on a big project like this can not only be expensive, but time consuming and dangerous if you are not trained the proper use of heavy power washing equipment. Hiring a professional to handle your driveway cleaning is the safer, cheaper and less stressful option. Repaving your drive is also another option, but having your drive way completely repaved can be expensive. If you have a concrete driveway, redoing your driveway will not only be expensive but time consuming as well, and it wont be too long before your driveway is dirty again. At Southern Clean Pressure Washing, our driveway cleaning services will make your driveway look like you just had it paved. Over time, your driveway will become riddled with dirt stains, puddle stains and rust stains. We have professional driveway cleaners who are trained to remove all of these stains from your driveway. We have several years of experience in the driveway cleaning business, and we can help you make your driveway look brand new again.